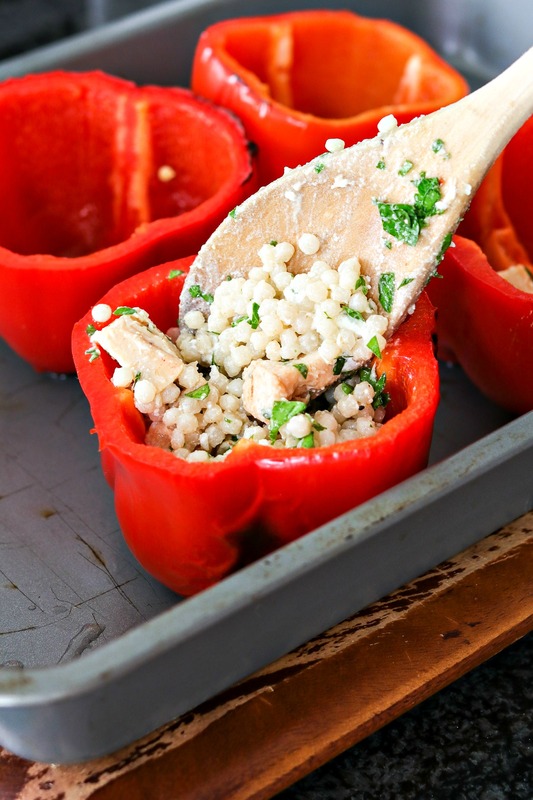 Chicken and Couscous Stuffed Peppers – A new take on stuffed peppers. This lighted-up option includes Israeli couscous, chopped chicken, parsley and goat cheese. The combinations of flavors is stunning. You won’t be able to stop eating it! I think it’s pretty obvious: I don’t do healthy food. That doesn’t mean I don’t eat healthy food; I just don’t eat healthy food that is anything special and definitely not exciting enough to share with you guys. My healthy food is usually something I can whip up for a quick dinner – just you’re typical boring salad or sandwich or grilled chicken. Say hello to chicken and couscous stuffed peppers. I became OBSESSED with these chicken and couscous stuffed peppers as soon as I made them. Actually, it was before they were even finished baking because I couldn’t stop eating the filling before it was even stuffed in the peppers. Goat cheese turns me into an animal. Oh yes, I said goat cheese. The stuffing is made from goat cheese, chicken, Israeli couscous (the pearl-looking kind), chicken, parsley, and lemon juice. The flavors and textures work so perfectly together, with the goat cheese adding decadent creaminess and the parsley and lemon adding the right touch of freshness. Now do you get why I was eating it straight from the bowl? Another awesome thing about this recipe is that it’s super simple to put together. The chicken is already cooked so you can use your leftover rotisserie chicken for this recipe. I usually buy precooked chicken for this one, which you can usually find near the deli. Just throw together the chicken, cooked couscous, chopped parsley, some spices, goat cheese (can’t forget that! ), and some fresh lemon juice. That’s it! Stuff it in the peppers and bake for a few minutes and you’re good to go! You can also substitute for a different couscous or even rice if you can’t find the Israeli couscous or simply don’t like it. But it tastes just like pasta so I don’t think taste is gonna be an issue here. Speaking of pasta, orzo pasta is another great substitute here. The possibilities are endless! Because I told you that I only share the most amazing, flavorful recipes with you, you gotta trust me when I say these stuffed peppers are one of the best things I tried within the past year. I am so shocked that something that tastes this good is also good for you. Win-win! If my husband didn’t hate goat cheese (blasphemous, I know! ), we’d be eating these every week. Make sure you purchase large peppers that can stand up on their own. You want to be able to stuff them with at least 3/4 cup of filling without them falling over. Place the peppers as close to the broiler as possible to get a good char on them. But make sure you watch them so they don’t get too burned! I like to add the ingredients together as soon as the couscous is ready. That way, the heat from the couscous will warm up the rest of the ingredients and, thus, will make the bake time much shorter. Make sure you use a baking dish that is safe for the broiler. Many glass dishes are NOT broiler-safe. I recommend using a metal pan like this one. A new take on stuffed peppers. This lighted-up option includes Israeli couscous, chopped chicken, parsley and goat cheese. The combinations of flavors is stunning. You won't be able to stop eating it! Place oven rack in top third of oven. If you need to preheat broiler, do so now on High. Mine does not need preheating so I skip this step. Cut top quarters off of pepper and remove membranes and seeds. Place tops aside, for now. In a baking dish that is safe for the broiler (I recommend a metal one), place peppers on baking dish, laying on their side. Place peppers in oven set to broil on High. Broil for 4 minutes and then flip to other side to broil for another 4 minutes. Remove from oven and turn broiler off. Preheat oven to 450 degrees. In medium bowl, add cooked couscous, parsley, olive oil, lemon juice, honey, salt, cumin, red pepper, and chopped chicken. Stir together to combine. Add goat cheese and combine. I like the cheese to melt into the mixture so I stir vigorously. But if you want them in chunks, be more gentle as you mix. Scoop mixture evenly into the 4 peppers. Top with pepper tops and place in preheated oven for 5 minutes, or until tops are cooked and stuffing is heated-through. Serve immediately. Oh my gosh, these look absolutely incredible. Definitely pinning so I can try this recipe in the future! Your pictures are beautiful! These look delish. My husband isn’t a goat cheese fan either. But I think I could get these buy him without him noticing. Aw thanks for the compliment! Since the recipe makes 4 peppers, I think it’s worth making just for myself. And they reheat great so leftovers aren’t a problem here. These are some great looking stuffed peppers! Bet they taste as good as they look. This dish is so vibrant and colorful. It looks delicious. Couscous and peppers are both wonderful, so this is definitely worth a try. Thanks so much! Such a great dish. Hope you try it out! Looks like a great lunch for me to take to the office. Easy to transport and filling! Looking forward to adding this to my recipe lineup! You are exactly right! Since my husband doesn’t eat these, I was taking leftovers to work for a couple days. Loved it! Stuffed peppers are one of my favorite foods and couscous is my hubbys. I might have to make this recipe soon so that we can have a bit of both! It’s a win-win for dinner! Oh my! This looks so delicious. Love the red color of the peppers. Thanks! Much prettier than green peppers, right?! Mmh, this is definitely something I will try because we love all of the ingredients! Thank you! Awesome! I’m telling ya.. you won’t be able to stop eating these! We love making stuffed peppers and this recipe sounds amazing! I love stuffed peppers, but never thought to use couscous in them! I love Israeli couscous and cannot wait to try this. My mouth is already watering!